Wish you could hold your style without masking it in crunchy stiffness? 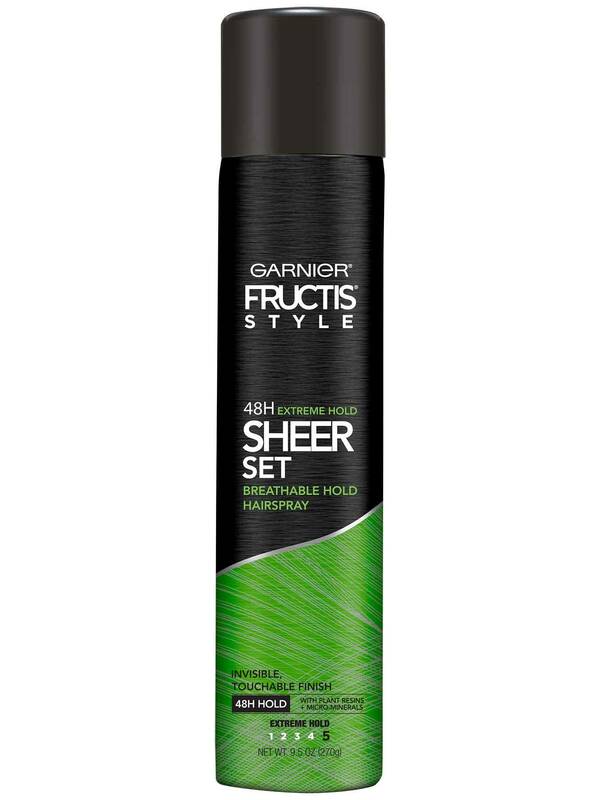 Garnier Fructis Style Sheer Set is a micro-diffusion, quick-dry, breathable hold hairspray that provides 48-hour extreme hold with an invisible, lightweight, touchable finish. Your style stays true. Micro-Resinite dual-technology combines plant resins and micro-minerals, providing a strong, yet breathable hold. Ultra-fine diffusion ensures a weightless, natural finish. Its water-free and humidity resistant properties provide ultimate, lasting control, letting you show off your style ... nonstop! Our light, sparkling fruit fragrance will leave your hair smelling fresh and vibrant. 1157962 ALCOHOL DENAT, HYDROFLUOROCARBON 152A, VA/CROTONATES/VINYL NEODECANOATE COPOLYMER, OCTYLACRYLAMIDE/ACRYLATES/BUTYLAMINOETHYL METHACRYLATE COPOLYMER, AMINOETHYL PROPANOL, PARFUM/FRAGRANCE, LIMONENE, LINALOOL, CANARIUM LUZONICUM/CANARIUM LUZONICUM GUM NONVOLATILES, AMYL CINNAMALM PARFUM/FRAGRANCE. F.I.L. C180904/1. Rated 5 out of 5 by buckeye from Can’t find in my stores locally! I love this hairspray as I have fine, thin hair and it holds without feeling sticky. Now I’m disappointed because I can’t find in the stores! Why are they not carrying anymore? Rated 5 out of 5 by LGH1920 from My Search is over!! I've finally found my perfect hairspray!! I have straight hair and this gives me great fullness that lasts all day. Rated 5 out of 5 by Humid in Texas from Why did you stop making!!! I live in Texas, Home of humidity and hard to hold hair! This stuff is amazing, and I CANT FIND IT ANYMORE!!!!!!! Whhhhhyyyyy???? Please, bring it Back unchanged!!!! Rated 4 out of 5 by treyzsongbird from new favorite hairspray I love this! lightweight with great hold. didn't have a nasty chemically oder. would recommend this to anyone. Rated 5 out of 5 by StaceyHarris from Awesome Garnier This hairspray was different than a lot of others of its kind. The hold was great but was very flexible and lightweight. The hold lasted for two straight days when I curled my hair and it had a very pleasant scent. Love it I would definatly buy this product when it needs replaced. Rated 5 out of 5 by Brittney220 from Garnier Fructis Style I love this product. I used it on French braids in my nieces hair and she played all day. The sheer set works well and is not a heavy crunchy spray! It has a nice breathable hold too! 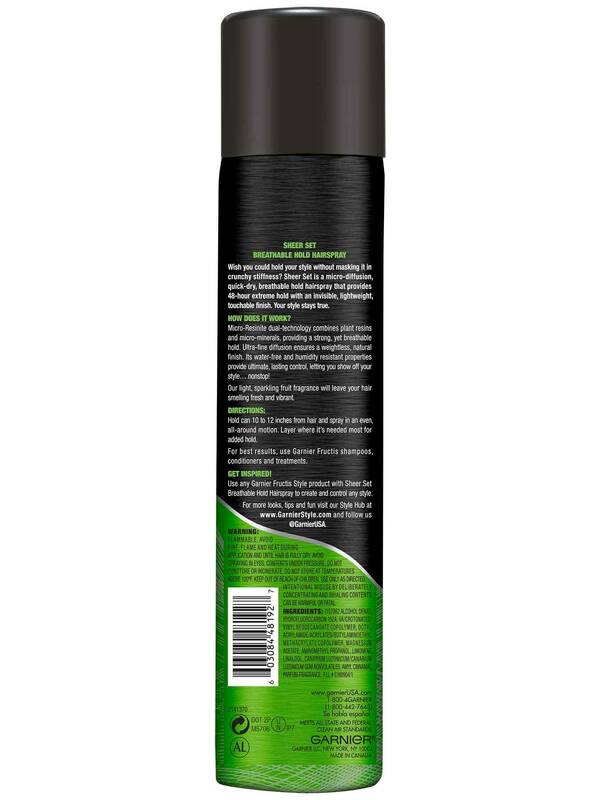 Rated 4 out of 5 by Jab295 from Garnier Fructis Hairspray This hairspray has some really good hold! I used it to hold my curls so they would last longer and it did an amazing job! I was able to wear my curls for three days and then wear it wavy for another two days before I washed my hair. The only thing I didn't like about this hairspray was that like many it made my hair feel a little dry. Overall it got the job done!